Recently, I lost my two Nigerian Dwarf bucks, Khan and Pappy. It happened nearly overnight – first Khan, who laid down in the evening after grazing with his friends and died. Utterly baffled and heartbroken, I patted the heads of the two remaining bucks, the La Mancha Dominic and Pappy, only to come out the next morning to find Pappy dead as well. Neither showed any signs of illness – not once during the several times a day they are checked on was one standing alone, away from the others, or standing hunched. No coughing, or scours. Both had come to me for pats and had appeared bright eyed and their usual selves within hours of their deaths. Khan’s cause of death remains inconclusive, but an examination of Pappy’s body confirmed pneumonia. With the wild swings in weather – cold and rainy one moment, hot the next, it is a common ailment in our location and we are no strangers to it. We are assuming this was the cause of Khan’s death as well. Many of you will understand the feeling of helplessness. What did I miss? What did I do wrong? The guilt was overwhelming, and then came the shame. How could I have let this happened? Failure is not something I have ever handled well, a remnant of a troubled past. Both Khan and Pappy came from the same breeder, a woman I greatly admire and consider a friend – in fact Khan had been a gift, born the same day my home and my life was in smoldering ruins. I had only purchased Pappy this year, and he was the best (and most expensive) goat I’ve purchased yet. What would she think when I admitted that I lost both of them? How would she ever trust me to purchase another of her valuable animals? The dread I felt in admitting to not just my employers, but the world, that I had failed was indescribable. I could hear the whispers of others now: “Who is she to give us advice? Who is she to claim to provide the best care, when she let both her bucks die?” I felt like I was being punished for making it through our horrifically wet (and therefor parasite and pneumonia filled) spring with such success. My employers, just as well worn to the goat world as I am, joined me in my grief for our lost boys. Through our tears, we traveled the last few days, looking for anything we could have done differently. On our farm, there is no blame to be laid – only the question of how we can do it differently next time. That only left the Internet – others might scoff at my hesitation, but others do not realize that I consider my Internet friends very real friends indeed. But I made the choice long ago to make our farm fairly public – sharing it on Facebook and Youtube, among other places. Opening our lives so that I can share our experiences to help others. So I squared my shoulders and confessed my sins – I had killed our bucks. The outpouring of support was amazing. Both my goat friends and my goat admiring friends gathered around to offer their condolences, give advice, and join me in my grief. They lamented the loss of such a promising young buck with me. They grieved the death of a solid friend who joined the farm with me after the fire. Just thinking about it, and everyone who joined me online in this time, brings fresh tears. Which just won’t do – it’s hard enough to see the screen as it is! 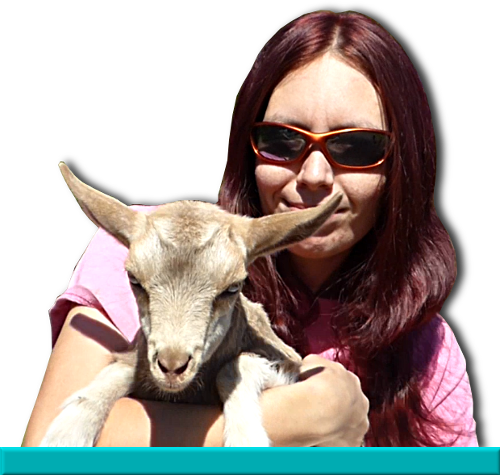 The point I am trying to come around to is the shame every goat keeper feels in this instance. We all have experienced this – goats find fabulously impossible ways to die, and hide their illnesses until the last moment. It’s something I know well – I have even consoled others during these times, reassuring them that we all go through this. We have all lost kids and adults to freak accidents, and strange illnesses, and terrible mistakes. We have all cried and felt ashamed. We have all been there. I understand. We understand. And you’re never alone. We do this because the rewards of keeping goats far outweighs the heartbreak they give us, but it never gets easier. I remember the name and face of every goat and kid I’ve lost. But now I don’t grieve them – I remember them, I celebrate their lives, and I thank them for the lessons they taught me.